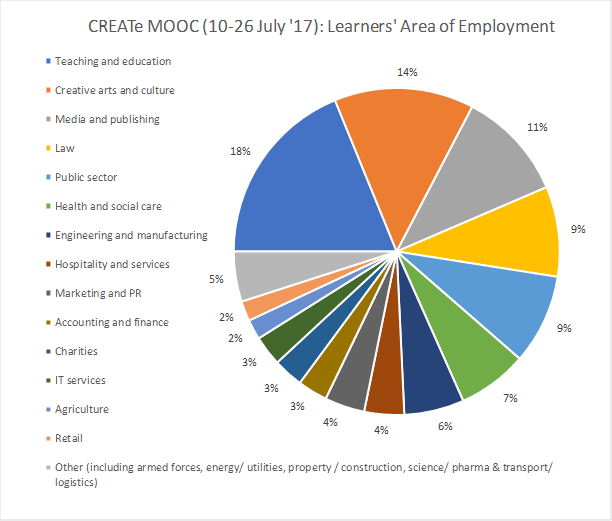 Dr Sukhpreet Singh (Director of the MSc/LLM @CREATe) and Kerry Patterson (CREATe Community Manager) reflect on the initial run of CREATe’s MOOC. CREATe ran its first MOOC (massive open online course) this summer: ‘Music Copyright: Understanding UK Copyright Law When Working with Music.’ Introducing learners to key aspects of UK music copyright law, it was developed by CREATe academics, Dr Sukhpreet Singh, Dr Kris Erickson and Bartolomeo Meletti and ran from for 2 weeks from 10th to 26th July. The first run of the free course was aimed at musicians and current or aspiring music industry professionals. It covered key aspects of copyright law important to creators, producers, marketers and distributors of music. The course was also designed to be useful to anyone working in other creative industries that use music, such as advertising, film, television and digital media. 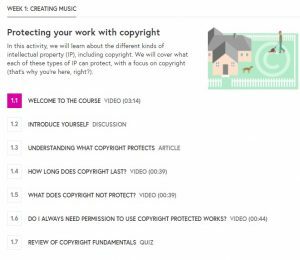 Contents of the MOOC were developed to help learners to answer basic copyright questions such as: what is protected by copyright and what is not? In what circumstances can creators reuse copyrighted material without permission or payment? How do collecting societies work? And how can musical creators earn money through licensing deals, self publishing or giving music away? The content included real-life musicians sharing their experiences throughout the course, offering advice on dealing with copyright, being copied by other artists and avoiding accidentally falling into a copy trap. Tracking provided by the Future Learn platform showed that nearly 1,300 learners enrolled in this first run of the course, of which around half were from the UK, a significant number from North America (including the US and Mexico, which was surprising for a course focussed on UK law), with some interest from BRIC economies. In contrast, there was a lower than expected interest from Western European countries, such as Germany and France, which have significant media and cultural industries. A gender breakdown of learners is not available as the registration software did not require learners to declare their gender. Less than 10% of the learners shared their area of employment, however amongst those who did, we can glean some interesting insights. As expected, given the subject matter of copyright, learners from the creative arts & culture (14%) and media and publishing (11%) groups composed 25% of the learner cohort. Most surprisingly, the second largest single group (18%) was from the teaching profession, perhaps indicating a curiosity amongst fellow teachers about how MOOCs are run or what content was being made freely available. Also unexpected was such a good level of interest within the Law profession (9%), given this was introductory and not a specialist law course, which may indicate an expectation of ongoing professional learning in this sector. There was also healthy participation from groups such as the public sector, health and social care, engineering and manufacturing, and marketing and PR, indicating a willingness to engage with copyright regulation and implementation of policy focussed issues in those industries. Other sectors included hospitality and services, accounting and finance, charities, IT services, agriculture, retail as well as small numbers from armed forces, energy, construction, pharmaceuticals & transportation. The large range of represented sectors speaks to the general appeal of the subject and the need for information which is authoritative but digestible for those without a legal background. 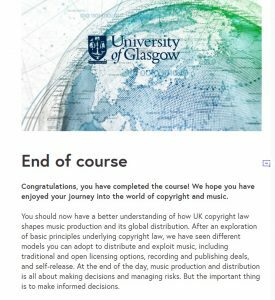 While writing and running this course, our intentions were to make music copyright a less fearsome issue for non-lawyers as well as to provide a pragmatic, practice based orientation. We hope we have helped in this way, and in the future would like to provide courses exploring copyright in other creative industry areas, such as television and film. With the next run of the course scheduled to begin in October 2017, learners can register their interest on: https://www.futurelearn.com/courses/music-copyright-and-me. The MOOC also provides a signpost to CREATe’s more formal learning opportunities in Intellectual Property, Innovation and the Creative Economy. Further information on the Postgraduate Certificate, Postgraduate Diploma and MSc / LLM level qualifications offered by CREATe and the School of Law at the University of Glasgow can be found at www.create.ac.uk/study. This entry was posted in CREATe Blog, News and tagged featured. Bookmark the permalink.